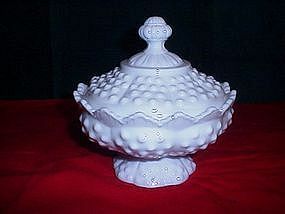 Fenton white hobnail covered candy dish. Excellent condition, no flea bites, chips or cracks. 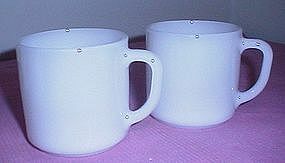 Federal Glass Coffee Cups, both are in great condition, no chips or cracks. Price is for both. 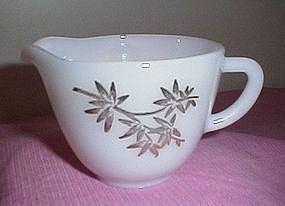 Hazel Atlas White Glass Coffee Cup, no chips or cracks, great condition. 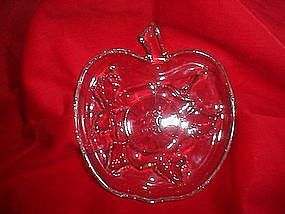 Indiana Glass Divided Relish Dish in the Killarney Pattern. Excellent condition. 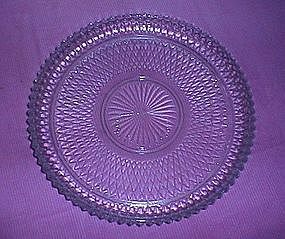 Anchor Hocking Burple pattern three footed bowl. 4 1/2" diameter. Great condition. 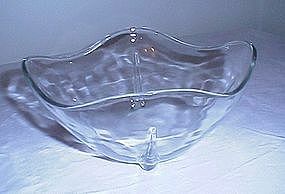 Anchor Hocking Swedish Modern Bowl, great condition. About 7 1/4" square and 3 1/2 tall. Beautiful piece. 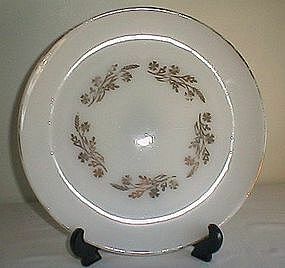 Federal Glass Petal Pattern Sandwich Plate, approx 11 1/2 in diameter. Has a small chip on the end of one petal. 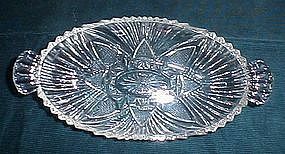 Indiana Glass Diamond Point 12" Hostess Tray. Excellent Condition! 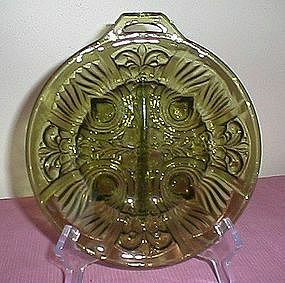 Hazel Atlas relish dish in Star and Fan pattern. Great condition! Federal Glass Golden Glory Creamer in excellent condition. Very slight wear to the gold motif. No chips or cracks. 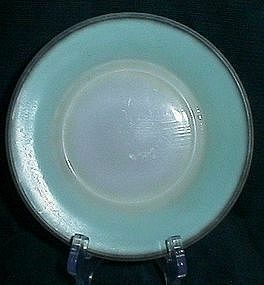 Hazel Atlas Green or Blue Ovide bread and butter plate, great shape, light wear, one has some manufacturer ripples on the white section. 2 bread and butter and one saucer available. 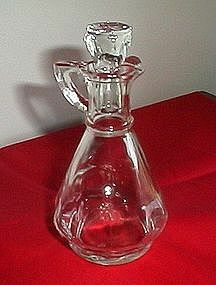 Hazel Atlas Glass Cruet has triangle like thumb prints around the bottom and small dots around the base, excellent condition. About 6" tall including stopper, marked with 11 and 8 on the bottom. 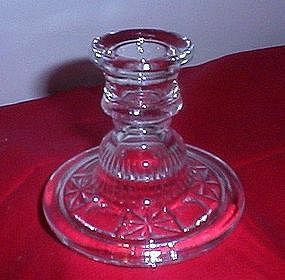 EAPG candle holder, unable to identify pattern. Stands 3 1/2" high, 4" diameter at the base. Excellent condition. 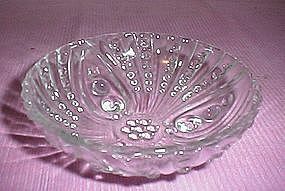 Gorgeous Jeanette Glass Serving/Salad Bowl. 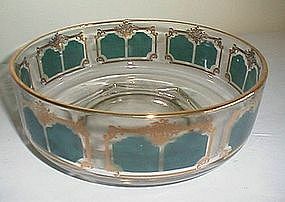 Has opaque green panels surrounded by gold trim and gold trim on rim. The foot is 6 sided and round in the middle. About 3 1/4" tall, 8 3/4" diameter. Great condition. 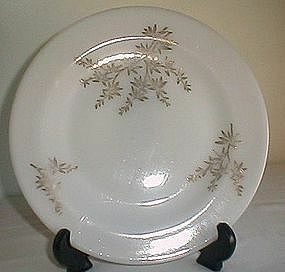 Federal Glass Golden Glory Pattern 9 1/8" Dinner Plate, very light wear. 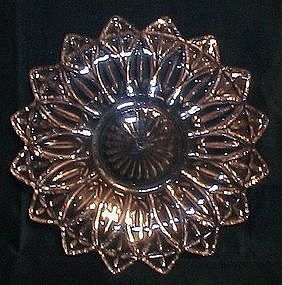 Federal Glass 11" Gold Pattern Serving Plate. Rim has moderate wear to gold, center motif has light wear. No chips or cracks. 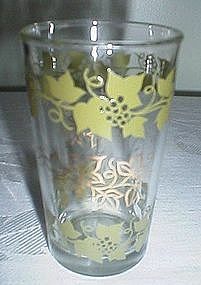 This is a nice juice glass by Hazel Atlas/Continental Can Co. The bottom is marked with three nested C's. 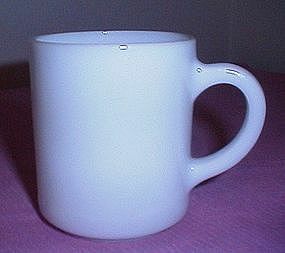 It is 4" tall, 2 1/2" diameter. Decorated with bands of green and gold grapevines. The band of gold has some fading.